The International Vocal Arts Institute is very high on our list this week and we are attending as many of their events as we can squeeze into our schedule. IVAI seems to be held in very high esteem also by the young artists participating in the program. We got to speak to a few of them and their enthusiasm matches our own. Some of them have attended several years in a row; there is always something new to learn, some barrier to break down, some new pathway opening up. 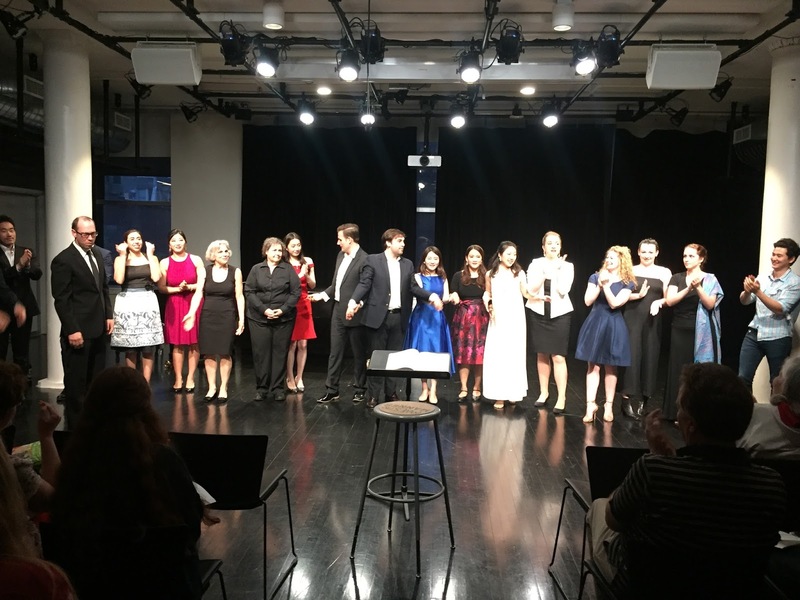 Last night's recital comprised duets, trios, and ensembles, coached by pianists Jane Steele and Liora Maurer and conducted by Maestri Paul Nadler and Brent Chancellor. 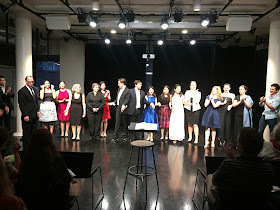 The scenes were staged by directors Joshua Major and Dietlinde Maazel although we perceived the hand of Founder and Artistic Director Joan Dornemann and confirmed her participation as we spoke to the singers. The overall quality was extraordinarily high. When we see and hear a scene from an opera and the sets and costumes appear unbidden to our mind's eye, we know the singers are doing well and putting their skills to good dramatic use. It was a thrill to witness the growth of the few singers with whose work we are acquainted but also a treat to be introduced to others whose careers we hope to follow. Most memorable was the performance of tenor Pavel Suliandziga whose Nemorino has been evolving over the past couple of years to the point that we consider it his signature role. We hope to witness his winning awards from several foundations with this role! He performed it with admirable flexibility in the coloratura and winsome personality. When Donizetti wrote the music for L'elisir d'amore, he gave Nemorino so much with which to play. If Nemorino is too shy and awkward, we won't believe that Adina will fall for him. But he can't be too personable at the outset or we won't accept the entire premise. Last night, Mr. Suliandziga performed "Caro elisir! sei mio!...Esulti pur la barbara" with his lovely scene partner soprano Jessica Hyun Joung Kim. We felt his character, under the influence of the "magic potion", coming out of his shell and trying to impress Adina. We had a grin from ear to ear! Two scenes from Donizetti's La fille du regiment delighted us; each young artist was completely convincing. Soprano Brynn Terry made us forget all about Natalie Dessay! This petite and very feminine young woman employed her bright soprano and coloratura skills, perfectly enacting the part of a tomboy. In the first scene she interacted with Sulpice, sung by the splendid baritone Evan Henke. In the second scene, she frustrated The Marquise of Berkenfield who was trying to make a "lady" out of her. The Marquise was performed by mezzo-soprano Olivia Smith-Grugan, who created a marvelously imperious character, actually playing the piano for Marie and mouthing the words of the song she wanted her niece to sing. Looking on and distracting Marie was Mr. Henke who kept bursting into the "Rataplan". The scene worked well with Marie breaking down into a tantrum. What fun! The versatile Mr. Henke also appeared in the sextet from Mozart's Cosi fan tutte, enacting the role of Don Alfonso, presenting Fiordiligi (soprano Zoe Chunghui Kim) and Dorabella (mezzo Daiyao Zhong) with their two lovers disguised as Turks. Soprano Eugenia Forteza performed enthusiastically as Despina with fine tone and spirited acting. Tenor Hyunho Cho had the role of Ferrando wth baritone Jarvis Dams as Guglielmo. Their outrageous behavior clearly offended the two sisters. Mozart's writing involved some stunning harmonies and the six voices blended and balanced well. Everyone loves Delibes' Lakme and "Sous le dome epais", known as the "Flower Song" gives soprano and mezzo an opportunity to harmonize the delicious vocal lines. In this case, soprano Sarah Heilman and mezzo Olivia Ottinger lived up to our expectations with both matching their dynamics. The overtones they created tickled our ears. They used a very long piece of fabric to create the river at their feet; it was a particularly lovely staging which added to the effect. Ms. Ottinger reappeared as Prince Charmant in the duet "Toi qui m'es apparue" from Massenet's Cendrillon with mezzo Daiyao Zhong in the title role. We liked her flexibility. A program with so much Donizetti is always a treat and his comedy Don Pasquale always tickles us. Mr. Dams made a fine Dr. Malatesta, instructing Norina (soprano Juri Jung) in how to fool the old man. Ms. Jung had to try several "faces" until Malatesta approved. We enjoyed the way he mocked the old man's big belly and waddling walk and we enjoyed Ms. Jung's penetrating upper register. Finally, we heard "O nuit divine" from Gounod's Romeo et Juliette, performed by soprano Melody Yun Xie who gave a lovely interpretation of innocence, and Yang Chen whose good sized tenor was a pleasure to hear solo after Juliette flees back indoors. The recital lasted not much more than an hour but we would have been happy to have an hour or two more. We wanted to mention one more thing. Everyone's French was merveilleux!